One of Miloh's favorite books is How Do Dinosaurs Eat Their Food? If you've never read it then I'll give you a brief synopsis. The first half of the book is questions. Do dinosaurs stick beans up their nose or smash fruit in their toes? And things like that. The second half is all about manners. It says no they don't do those things, they say please and thank you and have manners and all that. When we read it to Miloh it's cute... Every time we ask one of the questions (like do dinosaurs throw down their cup hoping to make someone else pick it up?) he answers yes. Of course we don't want him doing those things but it's funny when he shakes his head, smiles and says yes. And I'm not sure he really doesn't understand what he's saying yes to so we're good... Or not. Lately he's been imitating the dinosaurs... So maybe his yes answers were real. I'm pretty sure I was underestimating him. He's smashed potatoes into his toes. One night he put his foot on the table, looked at us and smiled. We said to take it off and he did. Then he put it back three more times. On that third time he stuck his foot in the air, spread his toes and smiled a big super cute smile. Then with his big toe he tried to flip his plate over. The whole time he was smiling and he even did his trademark eyebrow lift as if to say "watch me." We all laughed... How could you not. I mean it was funny. Completely inappropriate but funny. And that wasn't the end of it. A few weeks later he stuffed a pea in his nose... Actually shoved a pea right up his nose and smiled. Yeah he's a mess. 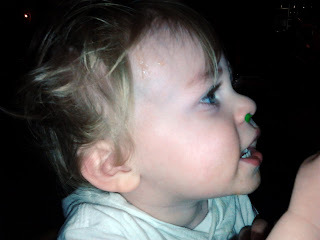 Notice the pea in his nose. Needless to say the book is collecting dust right now until he can understand the first half is bad behavior and the second half is good behavior. Moral of the story: When your kid has a pea in it's nose grab your camera fast, then clear the airway. I've just trawled through about 100 Dad blogs over the last two days. I like yours the best so far! Great stuff. Thanks. Not sure what you meant by "so far" as it is in fact the best. But still thanks, and glad you found it.